A few days ago I received a couple of emails asking what was going on in my home brewery and if I had brewed anything recently. Looking back I realized it’s been a bit over a month since I posted a brew session report and recipe. Well I have brewed since January and must say I’m really excited about this recipe! Last week was my birthday so I took the day off to brew a 100% Brett C and 100% Citra hopped Pale Ale (get it? C+C)….yeah I know whomp whomp I’m a child of the 90’s! Anyway once I finally got my hands on another pound of Citra hops I knew these were destined for a wild ferment with Brett. The mango and pineapple flavor/aroma of Citra seemed like a perfect match for the similar and complimentary flavors Brett C produces. 5 days before the brew session I prepared a 2000ml starter of 1.040 wort and pitched 2 vials of WLP645 Brettanomyces Claussenii…. Stirplated the entire time. No decant or crash cooling. The entire starter of Brett C was pitched and as you can see in this picture visual signs of fermentation showed up about 72 hours later with ambient temps around 65F. The day after this picture was taken I bumped the temps up to 70F. I will probably take a gravity reading next week on the 14 day mark. Like I said before, I am really excited about this batch! Citra + Claussenii and a fairly basic grain bill should make for a great summer beer. I’ll keep you updated on the progress of this beer and hopefully sharing bottles of this one near the end of May. Cheers! ***Update*** Bottled around the 90 day mark. Still has big hop flavor and aroma. I’ll probably shorten the “aging” next time and just let it develop more in the bottle if need be. Realistically you could turn this beer in a month and still get some wonderful Brett notes. I’m hoping to try this with BSI Drie or the Trois strain sometime. Wanna trade some Brett strains? I’m building up a library from dregs and blends. I may have to brew this one! A twenty gallon batch is huge on a homebrew scale, at least in my book. I’d love to see some photos of your homebrewery. I always love seeing another homebrewer’s setup. I updated that number to reflect the amount I end up with post boil to split across the fermentors. I shoot for 23 gallons post boil which leaves me apprx 20 gallons for packaging. I didn’t want to confuse anyone. I decided to go with the bigger system (old one was a Brew Magic) so I could do more fun stuff with Brett/Bacteria but still turn some stuff with Sacc yeast fairly quickly. I’ll do a profile on my system soon as a post. Thanks! 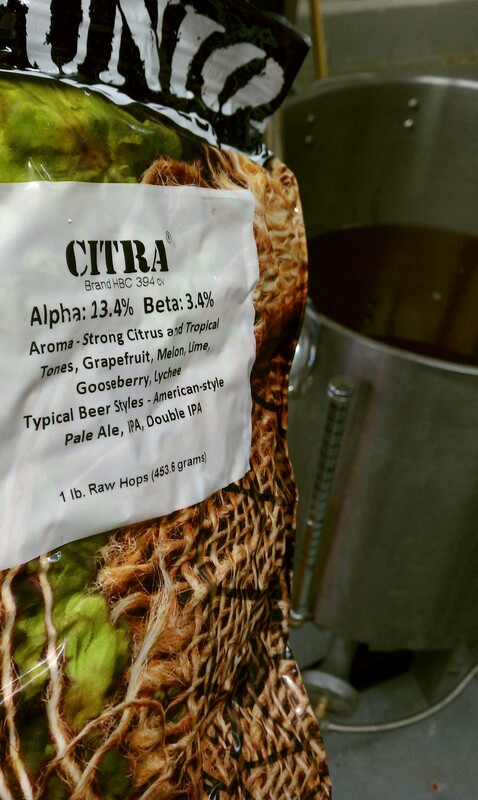 Agreed that Brett C and Citra are wonderful bedfellows. Did a 100% Brett C beer a while back that was just Pils and oats with Amarillo and Citra. VERY drinkable pale ale. Sounds like this one should be remotely similar. Sounds tasty. My Saison Brett C. has great pineapple flavors from the Brett C. so that should complement the citrus, mango flavors from the Citra pretty dang well in the summer! I just did my first 100% Brett beers. A (Brown Porter/Black IPAish) with Brett L, Brett B, and Brett Drie /Avery 15). I used locally grown hops so it may not be as bitter as planned. I also did a Biere de Garde and 1 gallon of that got 100% Brett Drie! Can’t wait until summer to drink these! How does that pitch rate work for you? What kind of attenuation do you expect to get, and how long does it take? Also, do you aerate? My understanding is that White Labs’ cell counts are pretty low, something like 1.75 billion cells per tube, so 2 vials in a 2 L yeast starter would still end up with a pretty low pitch rate…maybe 0.2 million cells/mL/deg P? I’ve only done one all-brett beer, but did 2 vials into a 1 L then into a 2 L starter. No aeration and got 85% attenuation. But if a single starter will do, I’d rather not expend the extra effort! I’m not answering for Brandon by any stretch of the imagination, but your attenuation will depend more heavily upon which strain of Brett you use and a lot less upon your pitching rate. I would expect attenuation of atleast 80% but wouldn’t be shocked if it was 90’s. I do aerate, but didn’t on this batch ( out of o2). The carboy got a few big shakes/splashes. I just got off the phone with White Labs about their Brett pitches. I was told that the reasoning behind the low cell counts in all 3 Brett’s was they expect people to use these as secondary yeasts, not primary. The cell counts in the Brett vials are 50-80 million per ml. I guess we need to start a campaign to increase the Brett cell counts in the vials! I’m really excited to see the final results on the batch. I was looking forward to. Brewing something similar. Soon. how did this turn out?? It was dry hopped for 7 days at room temp with pellets. Its now on day 5 of crash cooling and set to be bottled sometime this week. The sample I took before the dry hops was wonderful. Sounds great. Love to get a taste of that sometime. 20 gallon? Envious… 5 gallons pushes my current setup. But I dearly love my setup, so cranking out 3-4 gallon batches works well for me. I did this recipe about 8 weeks ago and kegged it up after 6 weeks. The beer tastes good and I enjoy the tropical fruit notes that I get from the Citra. I’m curious about the clarity though. It’s my first 100% Brett beer and I realize the Brett tends to be really powdery and not drop out of solution, but I had the beer chilled to 32 for 2 weeks and added Biofine clear (this is my usual procedure to get clear beer) and it’s still pretty darn cloudy. It’s not a chill haze, but could be some type of permanent protein haze. To me it looks like I still have some yeast in suspension. What was your experience with clearing of this beer? Nathan- I haven’t had too much trouble getting my Brett beers to clear on their own. Mine do tend to sit for atleast 3 months in the carboy then a week or so cold crash. I opened one of these last night as one of my Breaking Bad Beers and it was very clear. Do you treat your brewing water? I dont do much except use Calcium Carbonate or Calcium Chloride depending on what I’m brewing. With my water source I need to get the calcium ppm above 50 which seems to help flocculation. I don’t generally treat my water. I had it tested by Ward Labs last year and my Ca levels came back at 58ppm. I have added gypsum once to a standard pale ale, but I tasted some minerally notes and have since backed away from mineral additions. I have had good luck with getting clear beer on my Sacc brews and even on a JP Bam Biere clone I did so this Brett pale is throwing me for a bit of a loop. There’s not much to do at this point, I was just curious if others have had the same experience. It could have nothing to do with the Brett and just be a one off abberation with this brew. 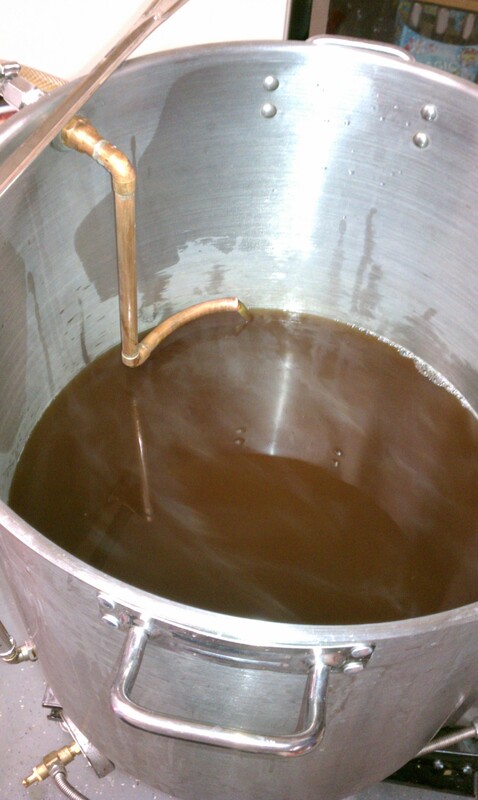 I collected the slurry and may brew another 100% Brett beer once the heat breaks. How do you think the Brett Trois would do in this recipe? Funny thing about that strain…If it was available year round it’s the one I would’ve chosen, but then I would have to chose a different beer name. Well I think I will just use trois then BC that’s what I have . And I’ll let u know how it goes. Wow. I just stumbled across this homepage. I really wish I found this about 12 hours ago. I am also experimenting with all Brett IPAs and just brewed my first attempt this morning. Similarly, I chose healthy doses of Citra for all my later/finishing hop additions, but went with a large starter of WL Brett B Trios in homage to Ithica’s Super Friends. I was a bit indecisive with how to handle the grain bill. While I wanted a little complexity in the malt profile, I have no idea how compatible some flavors would be with this Brett strain. So I took the conservative route and went with a Briess Brewers Malt/Pilsner combo with a good amount of wheat. I did throw in a touch 10L crystal and acidulated malt as sort a 1st level attempt to see how it ‘fits’ with the recipe. I am curious how the munich and subtle chocolate worked out with this Brett C IPA in comparison to ‘clean’ IPAs and how much ‘funk’ it ended up having? I’d like to know in anyone’s experience how limiting is Brett with malt and/or hops selection in regards to conventional IPA recipes (particularly more bitter ones), if at all. Is there anything that just clearly doesn’t work in ones opinion? Thanks for any input. Glad to hear you got a wild IPA kicked off and going. Honestly the Trois strain probably would’ve been my first choice for yeast if it was out when I brewed (although the beer name wouldn’t be as cool lol). The Munich didn’t really show up in such a small percentage, I was only using it so I could get “use up some older grain”. The chocolate was only for a slight color adjustment so it was never meant to impact flavor. The Brett C character is definitely there big time I really like it with the tropical notes of Citra. I’m going to do a recipe similar to this soon, but with the actual Drie Brett and Amarillo hops.I just need the time to brew (don’t we all!). As I said in the post I really try to back off the traditional bittering hops when using big portions of Brett. I just completed an XAPA experiment where I brewed 8 gallons of essentially MO, 5% Amber and 1% Acidulated malt, hopped with 25 IBU bittering, then everything else (~9 IBU’s) added in 5 minute increments starting at 20 minutes (Cascade) with knockout additions of Calypso/Amarillo and dry hopped with Calypso/Galaxy. This ended up being a OG 1048 beer with IBU’s about 34. I then split the batch in half and fermented half with Cal Ale and the other half with 100% Brett Brux. Both beers fermented in same chamber at 68 rising to 74F, but while the cal ale started within 6-8 hours, the Brett didn’t start until 72hrs. Cal Ale finished in about 7 days, while the Brett finished in about 19 days. I let both go an extra 2 days where I bumped up temp 2F for a day before dropping temp to 40F (then added dry hops before rising to 60’s). Both ended up about 1008. So why the post… besides sharing….? The Cal Ale version is amazing. The Brett beer is not. The aroma is complex, inviting, but it is the flavor that is a turn off. It is dry, but there is a strong, aftertaste that is bandaid like; almost emphasizing bitterness. I had taken a smack pack and built up a starter on a stir plate (1.4L) and added entire starter to batch. The beer is pretty clear, but could I be tasting yeast in suspension? Has anyone had similar experience? Is this just the Brett Brux and I should have used one of the other Bretts? Advice? Did I do something wrong? Both beers fermented in same chamber at 68 rising to 74F, but while the cal ale started within 6-8 hours, the Brett didn’t start until 72hrs. Cal Ale finished in about 7 days, while the Brett finished in about 19 days. I let both go an extra 2 days where I bumped up temp 2F for a day before dropping temp to 40F (then added dry hops before rising to 60′s). Both ended up about 1008. Last night I tried one of my Orval clones (where Brett Brux was used in the secondary). In comparison to the above 100% Brett Brux beer, there are similar flavors, but the 100% Brett Brux flavor is much stronger. I decided it is much better muted. Last night I tried one of my Orval clones (with Brett Brux in the secondary) and compared to the 100% Brett Brux above. Both beers had similar aromas, but the 100% Brett Brux had a much more intense flavor. I think I prefer the muted version. One of my best beers to date! Recipe was used with the addition of the dregs from 4 Crooked Stave bottles; 3 St. Bretta and 1 Hop Savant. Amazing sour flavor and funky aroma. Thanks! Rad! Sounds like you rocked it. How long did you let it age? Only five months. I wasn’t going to taste it until fall, but I was too tempted. I was very surprised by the sourness. I pitched the Brett C along with the bottle dregs. I have heard that some of Crooked Stave’s all Brett beers have some other bugs, but not real sure. I wouldn’t have expected that level or sour after such a short time. Do you reuse the yeast cake? I have heard folks on both sides chime in. I am blessed to live in Denver with Crooked Stave! Hey O! How was the fementation at that temp? How long to terminal FG, best guess, and what was FG? I did a two step starter for a month off a vial of Brett C – yielded around LOTS! Was going to start 1/3rd of that for a week in a 2L to gaurentee a bigOle pitch. Amarillo, Citra and cascade all late and dry hop (a dash of Columbus at 60). Based on your beer here, comments or concerns on my idea? Any insights appreciated. All the best and congrats on the progress of the blog! Fermentation was fine at that temperature. I think fg was 1.004 …it was mostly attenuated after 3 weeks. At the time I wanted to try the other Bretts because I thought Trois was going to be sold in pitchable rates (although according to recent tests it’s not a brett, but does give character as described ). I would probably stick with clausen to ferment, Rebel brewer that sells ETF kits includes clausen.